OLD PARKED CARS. 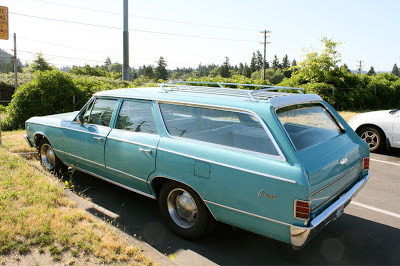 : 1967 Chevrolet Chevelle Concours Wagon. 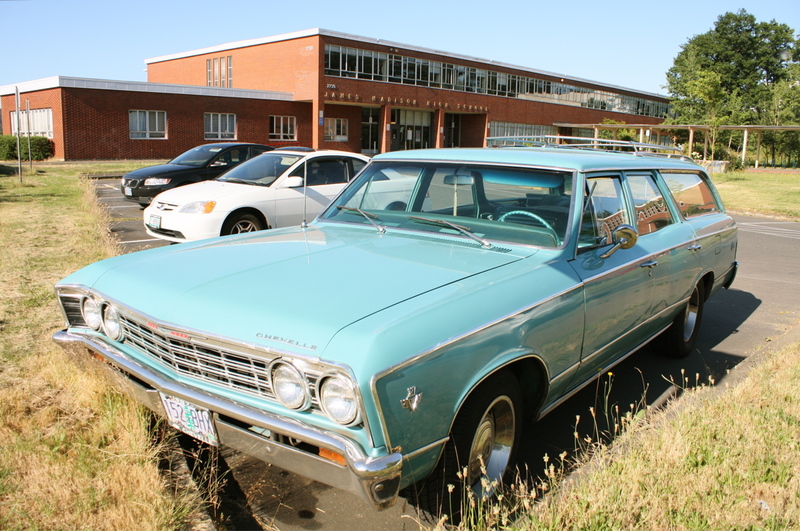 1967 Chevrolet Chevelle Concours Wagon. 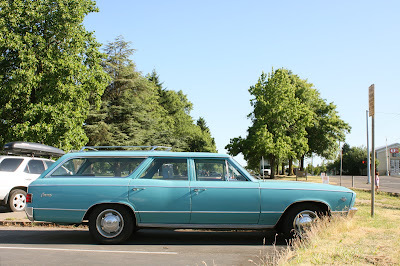 If you were paying close attention, you might have caught a brief glimpse of this car on the blog about a year ago. Within minutes, however, Ben texted me, "Can you post something that you didn't shoot with your phone? I have good DSLR pics of that car." So I deleted the post and waited eagerly to see Ben's photos. I'm still waiting. Then last week I made a visit to the skatepark near my house for a pre-work-day session. When I realized my tires had gone just a little too soft, I grumbled at the foolishness of not keeping a pump in my truck and packed up. But as I exited the lot, I spied this beautiful blue wagon, resplendent in the morning sun. I recognized it immediately. So the trip was worth it anyway. I even made it to work early. Nice commentary. Enhances the back-story on the blog. If I were ever to own a 67 chevelle, it would be the wagon. 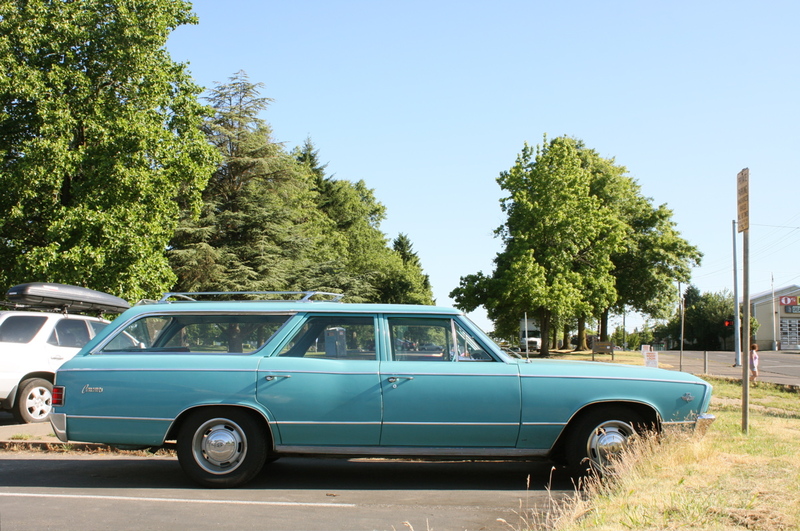 you see the coupes everywhere and you might see a 4 door here or there but I have hardly ever seen the wagon out and about. this is the coolest 67 chevelle in my book and the fact that it has the small block 327 makes it all the sweeter. So when was its previous appearance? I'm guessing it was a supporting player somewhere in the background, as I don't see a post featuring it. Poking through most of the posts with these tags didn't lead me to it, though. Thank you my friend. As usual, great photos. Have a nice day. I would totally road-trip across the country in that. Wow, I remember my Dad letting my sit in his lap and "drive" one just like this back in 1976-77!